The ugly part of this post is towards the end. But first, lets talk about pretty and delicious desserts. During my POM dinner party, I made some treats that I gave away with my party guests goodie bags. 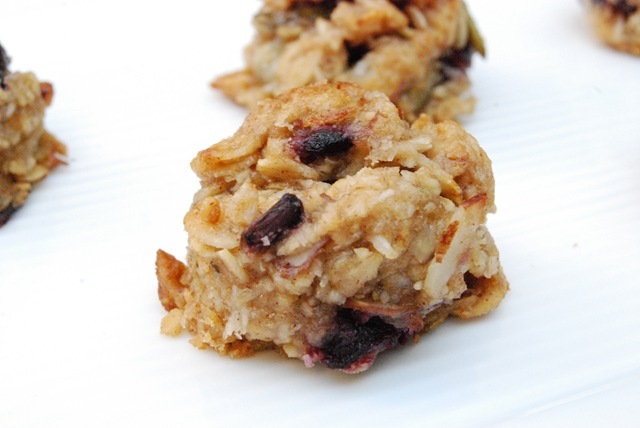 I was inspired by Heather’s Maple Nut Oaties and adapted these from her original recipe. 1 & 1/4 cup toasted rolled oats. Toast them in the toaster oven set on 350° for a few minutes. Watch them as they burn easily. Scoop cookie dough by tablespoon onto parchment lined or greased cookie sheet. Let cool for a minute before placing on the cooling rack. Sweet, chocolate and tart goodness. (Similar to chocolate + dried cherries combination, which I love). I love the reddish stains from the baked pomegranates. There’s so many possible combination for this recipe that I don’t think you can go wrong. Now for the ugly part. 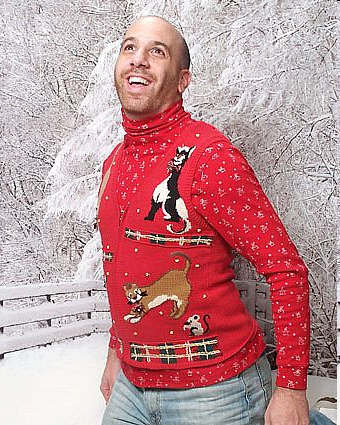 I’m going to a holiday party this week where the theme is “Ugly Christmas Sweater”. I don’t own any ugly sweaters (well, not ugly for me) so my mission the next few days is to find the ugliest sweater I can find. The uglier the better. Or I’m thinking of some homemade version that I can put together myself with what I have at home. Below are my inspirations. LOL I think this is hysterical that is such a funny festive idea. You need to go all out and get those wacky Christmas earring to go along with the theme too. Thanks for the recipe by the way I’m totally going to make these. Yummy. Hi Annette, thanks for the Christmas earrings ideas. I have some ideas and it might be easier to make at home than buy too. http://26.media.tumblr.com/tumblr_kt9xs4fbmG1qz8v3ho1_500.png Maybe this would perfect for your. Oh my god, that is hilarious. I just laughed out loud…thanks for the picture. It looks scary to put on, I’m clumsy and might choke myself, it looks like a rope. LOL I thought you would get a laugh you know what you can do if you don’t find one that’s good but I think you will find it at Walmart. You can go to Anna’s Linens and find some items and make your own, but I’m sure you will find it they are out there. I’ve even seen them at Macy’s. Haha – I’ve heard of those ugly holiday sweater parties. Hilarious! Personally, I love the ones from ebay with the lights. Haha! What a fun idea 🙂 I’m sorry.. but I’m afraid I don’t have a single ugly Christmas sweater to loan you 😛 I would try a thrift store? I went to a thrift store, there were some ugly sweaters…but not “Christmas” ugly. Going to goodwill and Walmart next. Oh my gosh. Those sweaters are too funny! LOL Your recipe looks really good too. I LOVE that theme for a Christmas party! 🙂 Ha, ha. Too funny. Hah! 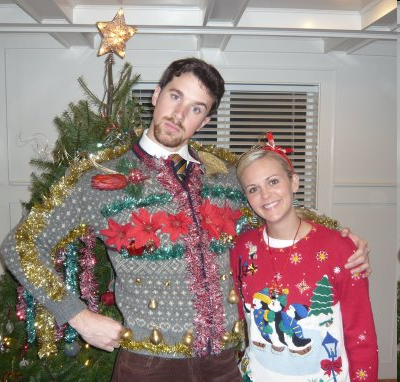 I’ve always wanted to go to a ugly christmas sweater party! ps. 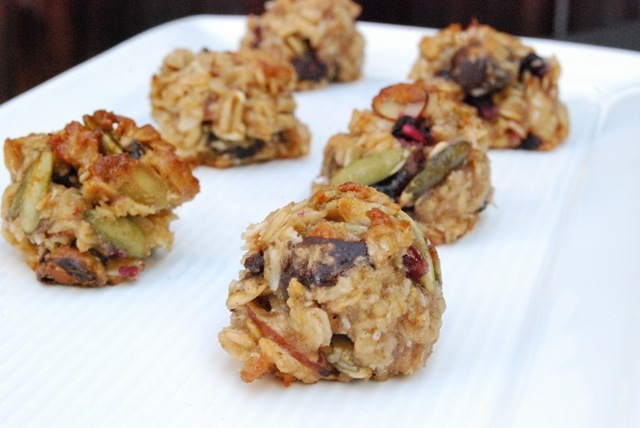 your POM, Chocolate & Nut Oaties looks great! I’m actually going to an Ugly Sweater Party as well and just an overall Christmas themed party…I’m going to be a Christmas tree ha. Oh man those sweaters look awesome. 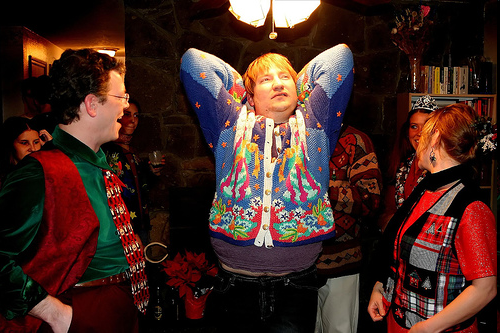 I’ve never been to an ugly sweater party before, but I bet they are loads of fun and laughs! i would love to throw 5-10 of those oaties in my mouth right now. 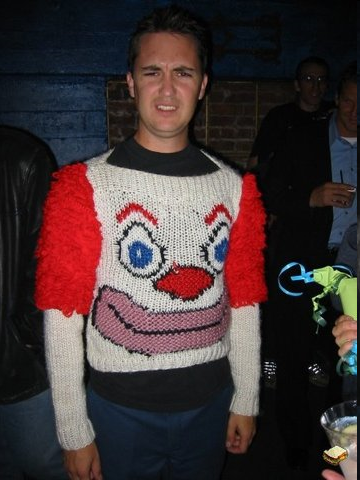 the clown sweater is so awful! 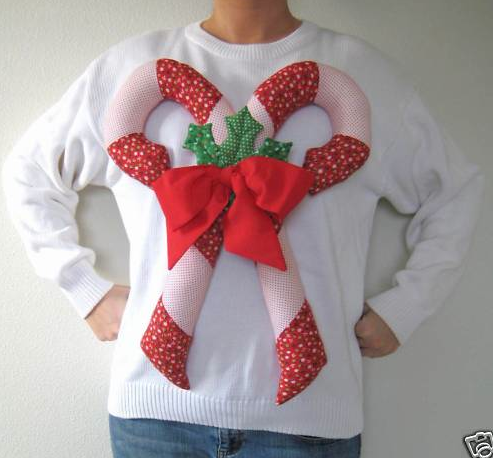 i’ve never been to an ugly sweater party but i really want to go!! 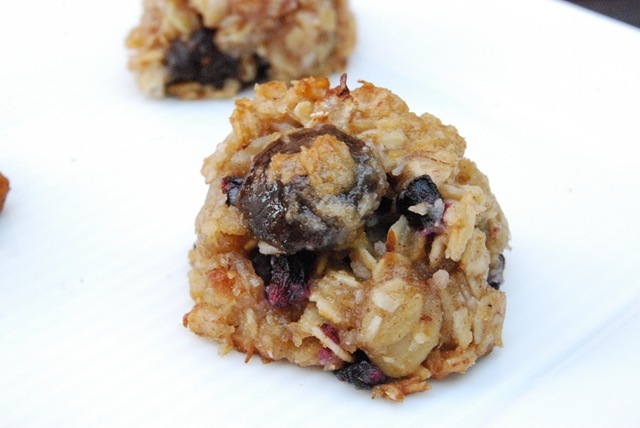 Love how you “Healthy- coconut-ized” Heather’s oaties. I made her oaties, with a few tweaks on my end, a few months ago. So yummy with the additions of nut butter, nuts, oats, dried fruit…..
Those xmas ugly sweater parties are too, too funny– sadly I have not yet been invited to one this year! I’m a fellow coconut lover, too. Yum! I think this is the cutest party theme…I used to work at Talbots about 100 years ago and I remember we’d have to wear the ugly Christmas sweaters for the month of December. My God, any of those would have won ugliest sweater hands down!! Ameena, I can only imagine what they looked like. I used to work with these ladies that always wore themed sweaters during any holidays throughout the year. Maybe they shopped at Talbots? Thanks for checking out the blog, it’s good seeing you on here 🙂 Aren’t they ugly? so hilarious just picture people wearing them. Haha! The sweaters are too much! Love it! Not a lot of Christmas sweater parties in my neighhood though….Guess it’s too warm in Hawaii for that! Thanks for checking out my blog. Yes, that’s true…it’s going to be too warm for sweaters in Maui. How about bathing suit party with ugly Christmas tie? That might be a stretch of an idea, but I can picture it and it would look hilarious on the surfer boys/girls. So funny, at least now you have sweater supply for these type of parties. Oh how fun that you do this party at your work, what a fun place you work at. But then I saw what you did to your boss’s office with the sticky notes and pretty much guessed your work must be a lot of fun. Or you make it fun? he he he… my friend Jaime and I sort of “force the fun” when it comes to such things. 😉 But there are a few people who get really into it! These look delicious! Love the pomegranate/chocolate combo!